I just had to write to you and tell you about Sam’s turtle, Speedy. Speedy is a red-eared slider turtle that Sam found three years ago while we were living in Tennessee. Speedy only has three legs, so he is a special turtle! Speedy lived in Sam’s room in a nice, big, aquatic turtle tank where Sam took good care of him. What you might not know about red-eared slider turtles, is they can live up to 70 years! YES, that’s right! 70 years! I had no idea about this tidbit of information when I agreed to this turtle idea three years ago. Last summer we moved to NC and of course Speedy came with us. It was then that I noticed how much he was growing. We already upgraded Speedy’s tank the Christmas before, but now he was growing even bigger. I had no idea what to do about it, so I decided to do a little research and see what other people had to say about these terrapins. It is never good when you come across a blog about red-eared slider turtles that reads, “Think twice before keeping that cute little turtle.” I learned that these adorable tiny shelled critters grow larger than a paper plate and require much attention and money! One might ask why a responsible parent did not do this research before they gave an innocent child permission to keep the turtle. Yes, one might ask. Well, by now it was too late! Speedy was a family member, and he was getting bigger by the day. Bryan and I were not sure what to do, so we did what any desperate parent would do. We tried to talk our nine year old son into releasing a three-legged turtle back into the wild. Yeah, it did not go so well. We have a pond right beside our house so we began talking with Sam about how wonderful it would be for Speedy to have more room to swim. We told Sam that Speedy deserved a chance to have a family (including a wife and potential baby Speedy turtles). We talked about how happy Speedy would be basking in the sun on a nice big rock with other turtles. You can imagine how that turned out. Sam would not have it! He was totally against it. He quickly reminded us that Speedy only had three legs and that he was not a strong swimmer. He told us that Speedy could never survive on his own and how he would most definitely die! AND–how could we do that to a member of the family??? At the rate this was going, I was quite sure Speedy would end up in the nursing home with me. I had already given up on this turtle moving out of my house, and had already begun researching 100 gallon turtle tanks! Sam just up and decided he wanted to set Speedy free and he wanted to collect baby turtles in his tank. He told me he had been thinking about it and I was right. Speedy was getting too big for his tank, so he was going to set him free and set up a turtle care center in his room. Grow the turtles up, release them and catch new ones. This happened fast, my friend! 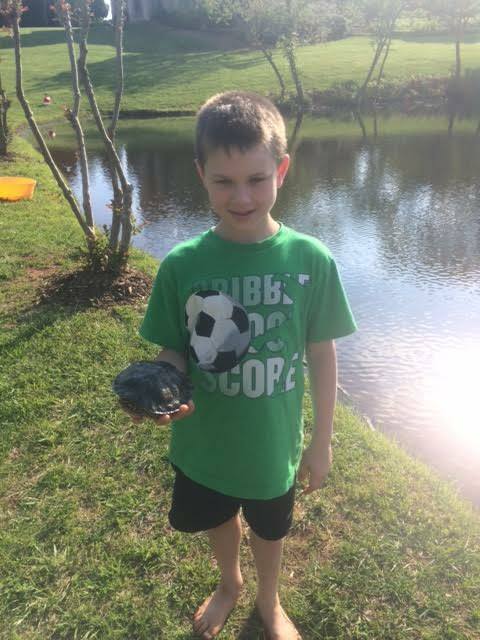 Within minutes, Sam got Speedy out of the tank and he and his friend, Ethan, put Speedy on the bank of the pond. I grabbed my phone so I could capture this moment with photos and videos as we watched Speedy, the three-legged turtle, set sail on a new adventure! As I watched Speedy’s shell sink beneath the pond’s surface, I thought about how hard it was for Sam to let Speedy go. I saw a few tears in Sam’s eyes, but I also saw joy on his face when he saw Speedy swimming on his own. I was reminded of what it’s like being a Mom. We have these sweet little babies and little by little they grow up until one day we realize just how grown up they are. We begin to understand that they no longer need to be under the direct supervision of Mom and Dad. We realize they are ready for a life out on their own. There is a time when we must let them go. If you’re a mom, then maybe you’re like me and your kids are still at home. Or maybe your kids have already set sail on their own life’s adventure. Either way, life passes by quickly and with each season of life, there are challenges which pull at our heart strings. I think Sam learned a valuable lesson by releasing Speedy. He learned what it’s like to love something with all your heart and how to have the courage to let it go. He learned that some things in life only last for a season and then they are gone. You know what? I learned those lessons all over again, too. Made me cry! My daughter is graduating this year. That is a good story. I wish speedy well. Will share with my sister who is worried about my neice. Hard to let em go. This made me cry. In a good kind of way. I love your ministry! You encourage me through facebook and blogs. Always speaks right to me. Keep up the good work for the kingdom. To God be the glory! Really needed this today! My daughter will be graduating in June and she has been dating her boyfriend for over 2 years now, and it has been very hard for this mom to let go and let God! How is it that these blog posts always speak to the very issue that I am dealing with? Seriously, who knew I would cry over a turtle. Great blog and good thoughts. Love this ministry!